ModuTank, Inc. collapsible bladder tanks are designed for containment of liquids for short-term, emergency, and quick-response deployment of fuel and water where storage is quickly needed but unavailable. Our bladder tanks have been proven in widespread military, civilian, and industrial usage. Compactly folded and packaged for easy transportation by truck, ship, or air, these portable containment systems can be set up quickly on any flat surface, indoors or outdoors. Civil engineering is not needed. Bladders are constructed from high grade, coated materials that comply with NSF and FDA regulations, and also meet strict military specifications. All of our tanks receive and meet rigorous testing to ensure that our clients will get quality dependable products. The latest bonding technology is used to manufacture, fill, and drain assemblies. We have a wide variety of CAM and groove couplings for hoses and pipes including aircraft fuel configurations as well as vent assemblies, threaded flanges, recirculation valves, swivel couplings, access plates, flame arrestors, and filler/discharge assemblies. 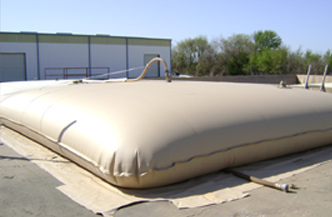 We offer a wide range of standard bladder tanks in capacities from 160 to 50,000 gallons. You can also request customized measurements. These bladders will be individually designed and built according to your specifications. Constructed from FDA and NSF compliant potable water grade fabric, the lightweight “onion tank” is designed for easy handling and compact shipment, and can be instantly set up. 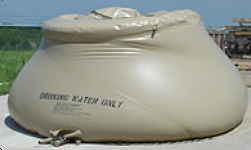 Tops of tanks are fitted with waterproof zippers for easy filling and inspection. They are packed in carrying valises for movement by one or two people. Standard two-inch drains with brass open/close valves are incorporated into the bottom of the tanks, so that they can be much easier drained using only gravity or with the help of pumps which can be secured onto them. Call us today at our toll free hotline (800) 245-6964, or email us at Contact Us. Click on the link below to be sent to the Contact Us page.